A Gaslamp fixture, this spacious restaurant mixes sophisticated dining and casual tapas in the E-5 Lounge. 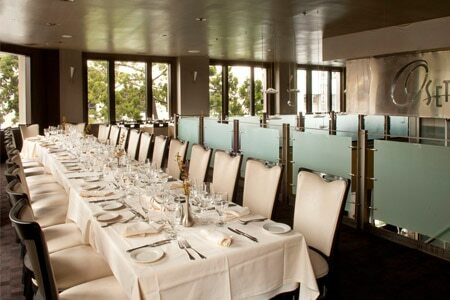 : Located in the bustling Gaslamp Quarter, Osetra is known for offering fine seafood, pastas and a good wine selection. Osetra also features caviar and a variety of drinks to choose from, including the house favorite Persian Pomegranate Martini. The extensive sushi menu features everything from classic California rolls to sashimi plates. The signature Osetra sushi roll is incredible, but if you're more into turf and less into surf, Osetra has you covered with Prime, aged steaks. Osetra is a great restaurant to enjoy happy hour, too, where guests enjoy small plates like calamari and Seafood Napoleon. Oyster lovers will enjoy them Rockefeller-style or as the daily special.